One of my first K8000 applications for my FEZ board was an RC-5 receiver. This is a receiver which can decode signals that are sent from a Philips compatible remote control. 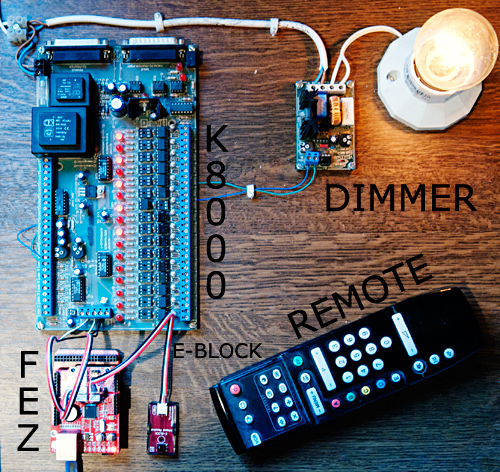 In other words: You can control your K8000 with a standard remote control. All you need is an IR receiver that is connected an analog (An2) input of your FEZ. GHI Electronics - the manufacturer of the FEZ - offers an addon for this: 'E-Block 38 kHz infrared receiver'. Using this E-block the easiest way since you can simply connect it to the FEZ with a JST3AA cable. If you prefer building your own IR-receiver you will need to get a receiver module 'TSOP4838'. This is a little integrated circuit with 3 pins: +VCC, GND and OUTPUT. You can power it with your FEZ and connect its output to the An2 input on the FEZ. The image below shows you developent setup. Here the FEZ is connected with the K8000 through the SCL/SDA and GND lines. The Ir E-block is connected to the Di2 analog input of the FEZ. The K8000 controls a Velleman K8000 dimmer that is connected to the 8-bit D/A output DA01 of the K8000. Here you can download the source code for this project. As for all my FEZ applications, it is written in Visual C# 2010 Express.